The first step to determine the presence of asbestos is to test. Are you prepared if the results come out positive? Asbestos was commonly used in building materials between 1920 and 1989. After 1989, the Environmental Protection Agency (EPA) strictly prohibited the manufacturing of asbestos materials due to the health hazards it caused onceit started to deteriorate. Researchers found that people exposed to asbestos were experiencing scar tissue within their lungs from breathing in sharp, microscopic fibers which lead to mesothelioma and asbestosis. It was concluded that asbestos could be lethal to the human body. Unfortunately, structures originally built with asbestos-based building materials must take greater precautions during the remodeling and demolition process. That is why many of our clients request us to test for asbestos PRIOR to their remodel or demolition project. This way, they understand which areas (if any) are affected by asbestos and which ones aren’t. AF Environmental has been successfully removing asbestos from residential homes, commercial buildings, office structures, healthcare facilities and industrial plants since 2004. We are experts in asbestos testing, which help us identify if your home or business has asbestos ridden building materials. In addition, we can also test to see if dangerous levels of asbestos have become airborne- possibly affecting the occupants of the building. Our team is experienced and follows the specific procedures and processes for successful asbestos testing. We can provide a fast turn-around to provide you the proper information to move forward. At AF Environmental, we take the testing process as seriously as we would the abatement services. During the test, it will require us to take samples back to an EPA certified lab, which requires a small level of disruption to the asbestos material. When you choose AF Environmental for your asbestos testing we will adhere to the EPA guidelines for asbestos testing to maximize the safety of your occupants and building. Step 4: Prevent suspect particulates from going airborne by sealing the sample area with drywall tape, plastic sheeting or tape. At that point, we will send the sample to the lab and wait on the results. Depending upon the results will determine our next step. If asbestos is present, we will discuss with you a proper plan for abatement- based on your specific needs and level of asbestos present. If the tests come back negative, we will come back and make any repairs to the areas where we extracted the sample-making the area look as good as new. If you are considering a demolition or remodeling project on a building older than 1989, it would be wise to run an asbestos test on your property. 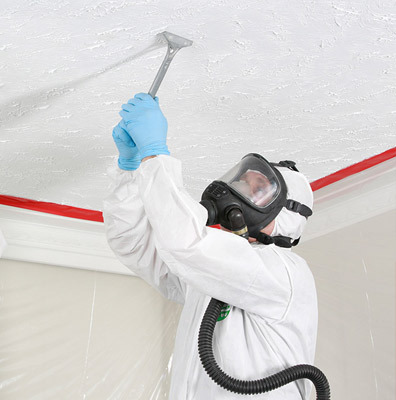 AF Environmental is the industry leading expert in Texas for asbestos testing services. We hold the proper licensing to take on projects of all sizes. In addition, we are a full-service asbestos abatement and construction company who can handle your project from the test to abatement to full remodel. When it comes to asbestos, we are the industry leading professionals with the proper expertise to keep your project moving along. We understand that time is money. When you choose AF Environmental for your asbestos testing, we will work fast to get your project back up and running. Asbestos doesn’t have to slow you down. AF Environmental can be your partner in successful asbestos testing and abatement services.